Effect of Ga on P. aeruginosa growth. 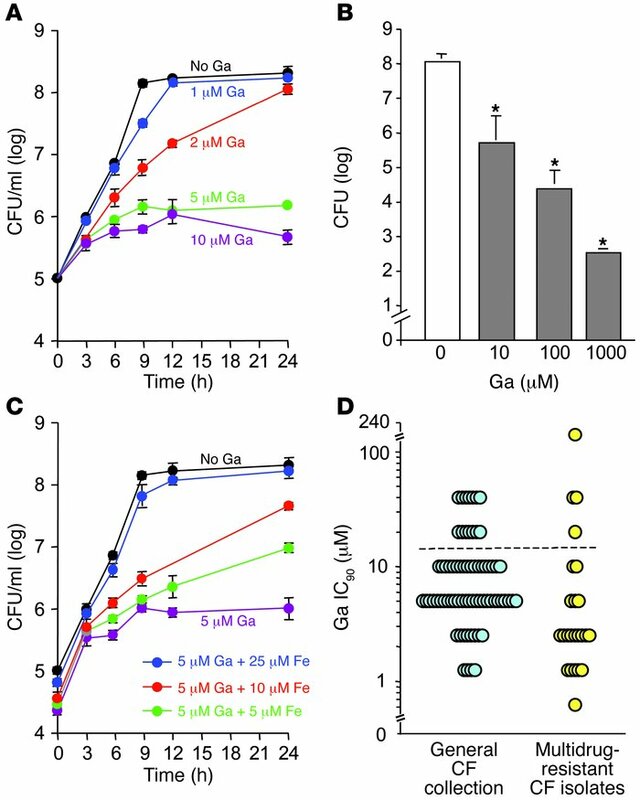 (A) Ga(NO3)3 inhibits P. aeruginosa growth in a concentration-dependent manner. Experiments were performed in biofilm medium at 37°C, and data are the mean of 4 experiments; error bars indicate SEM. (B) Ga kills P. aeruginosa. Bacteria were grown in TSB to stationary phase and incubated with indicated concentrations of Ga(NO3)3 for 24 hours. Cells were then pelleted and washed 3 times to remove Ga, and viable bacteria were enumerated by plate counting. Data are the mean of 3 experiments; error bars indicate SEM; *P < 0.001 versus the untreated control. (C) The addition of Fe (FeCl3) diminishes Ga’s growth-inhibitory effects. Data are the mean of 3 experiments; error bars indicate SEM. (D) Ga sensitivity of P. aeruginosa isolates from chronically infected CF patients. Clinical isolates and PA01 bacteria were grown for 24 hours at 37°C in BM2 succinate medium with 0.1% casamino amino acids with increasing (2-fold) concentrations of Ga(NO3)3. The IC90 of PA01 (determined by measuring OD600) was 10 μM Ga in this medium. Isolates represented by points lying above the dotted line were more resistant than PA01. Data are mean of 2 measurements for each isolate.